During the winter season, Leavenworth is a wonderland of natural beauty blanketed in glistening white snow. If you’re hoping to immerse yourself in this scenery during your next winter getaway, you’re in luck! There are a wide variety of winter activities in Leavenworth, one of which is snowshoeing. This exciting winter sport is an ideal way to explore Leavenworth’s winter landscape and spend quality time with your loved ones in the great outdoors. Here is everything you need to know about snowshoeing in Leavenworth and the best spots to enjoy this activity. Snowshoeing in Leavenworth is just one of the many wonderful winter activities in our beautiful destination. Request your free copy of our Vacation Guide and you’ll instantly receive a downloadable list of our area’s top activities and attractions including outdoor recreation, restaurants, events, shopping, and much more. It’s the only thing you’ll need to plan the ultimate winter escape to Leavenworth. For those who are unfamiliar with the sport, snowshoeing is a thousand-year-old winter activity that is known for its versatility. It’s also a very budget-friendly and easy option for those who may find skiing too challenging. All you have to do is attach the snowshoes to your winter boots and you’ll be gliding through the snow in no time! With over 35 years of experience, Blue Sky Outfitters provides some of the best outdoor activities and tours in Leavenworth. During the winter season, they offer memorable snowshoeing tours through the Leavenworth Valley and the Alpine Lakes Wilderness Area. Their most popular tour is the Snowshoe/Wine Adventure, which allows visitors to embark on an epic snowshoeing adventure and then indulge in a light lunch and local wine tasting. Plain Valley offers more than 100 km of groomed trails in Leavenworth, WA, five of which are dedicated to snowshoers. All you have to do is rent a pair of snowshoes and get out to explore the beautiful Plain Valley. After your snowshoeing in Leavenworth journey, come back to enjoy even more winter activities available at Plain Valley Nordic Ski Trails, including skiing. Located atop the Cascade Crest, Stevens Pass Mountain Resort is one of our area’s most exalted ski resorts! If you’d like to try snowshoeing here, the Nordic Ski Center offers something for snowshoers of all skill levels. Please note that Nordic Center maintained snowshoe trails require a trail pass which can be purchased in the Cascade Depot at Nordic Center. Boasting impressive Switzerland-type views and easy water access, Lake Wenatchee State Park offers abundant recreational activities in any season! During the winter, snowshoeing is one of the park’s most popular activities since over 45 km of trails are open for exploration. You’ll also be able to enjoy activities such as cross-country skiing, dog sledding, and skiing. That’s right! Our own bed & breakfast is one of the best places to enjoy snowshoeing in Leavenworth. We have state of the art snowshoes for every guest here that are free to use. Strap them on at your leisure. We’ll give you a quick lesson if you like and give you tips on enjoying the valley. There is nothing like the quiet and solitude of trekking through the snow. 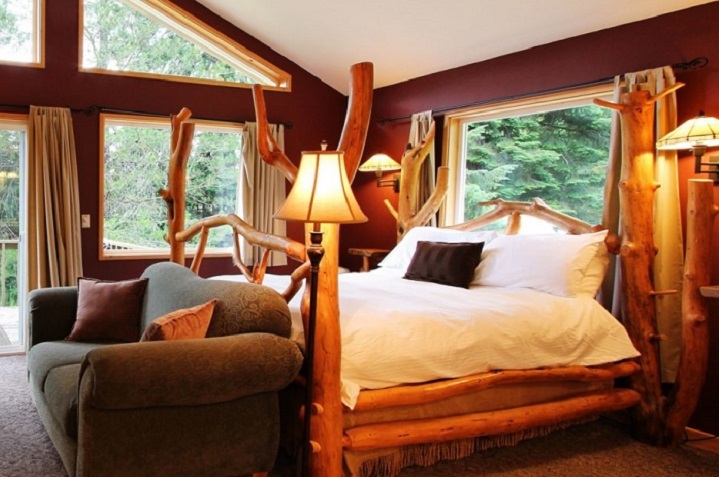 For only the best local accommodations, we invite you to book your stay at Pine River Ranch Bed & Breakfast. Our historic inn located in the Cascade Mountains is ideal for couples and all travelers seeking a peaceful escape. Our guests experience cozy and rustic-style suites, unique amenities, and a piping hot breakfast delivered straight to their door each morning. It’s the perfect alternative to typical Leavenworth hotels and provides a unique experience you won’t soon forget. Book your favorite room with us today and we look forward to seeing you soon!